The morning line favorite is Bag of Tricks (#1), who has been visually impressive since returning from the layoff this past winter. The 109 speed figure that she earned last time out is the highest number in the field, so she is the horse to beat. That said, there are a few things working against her today. She’s breaking from a difficult post position down towards the rail, given that there’s other speed drawn to her outside. Additionally, John Kimmel does not do well with runners coming off wins (53 trainer rating) or with horses moving up from allowance to stakes company (2 trainer rating). We prefer the Rudy Rodriguez-trained pair of runners. Katniss the Victor (#4) turns back in distance after an easy allowance win back in late March. She proved her quality when finishing a good third in the open Busher Stakes earlier in the winter and should get some pace to close into as she turns back in distance. Frosty Margarita (#5) may have been somewhat compromised by a wide trip last time, but still was a little disappointing as the favorite. However, she usually shows up with a competitive effort, so we can’t count her out. Absatootly (#10) competed against a surprisingly deep field out of town last time and ran well to be third after making a wide middle move to the lead at the quarter pole. 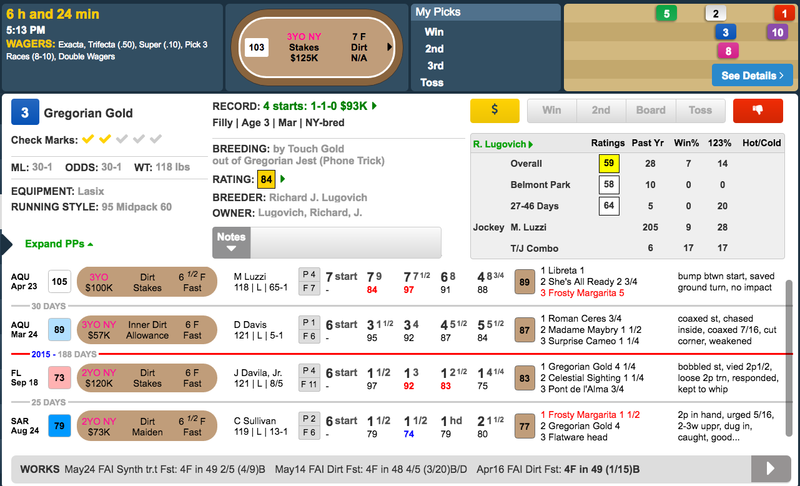 We’re not sure that she really wants to go seven furlongs, but she’s worth throwing into the mix if she’s going off at upwards of 8/1. Flatterywillgetyou (#2) has been keeping slightly weaker company, but she has run two of her best races over wet tracks. All of the aforementioned fillies have their merits, but we’ve gone in a different direction for our top pick. GREGORIAN GOLD (#3) has run slower speed figures than the aforementioned fillies, but we believe that she’s more talented than it appears. She was good in her debut last summer, nearly holding off Frosty Margarita, prior to easily taking a stakes at Finger Lakes. She probably needed her return in March, and then last time she lost all chance at the start. This is a filly that wants to be placed up close to the pace, and she was squeezed back to last a few strides out of the gate. She then encountered more traffic when attempting to rally between horses in the stretch, and actually finished up decently thereafter. She’s hardly the most likely winner, but she’s going to be a gigantic price, and we don’t think she’s without a chance to pull the upset.